Multiple sclerosis (MS) is a neurodegenerative disease of the central nervous system (CNS). It is the leading cause of non-traumatic brain disability in young adults in the US and Europe with patients experiencing a range of neurological deficits from motor paralysis to cognitive decline1,2. Medical costs per patient comes to an average of $21 000 a year, making it the second most costly chronic disease next to congestive heart failure1. MS is characterized as an autoimmune disease where self-recognizing T-cells penetrate the blood brain barrier and attack the insulating myelin sheaths of axons. This demyelination process subsequently leads to neuron degeneration and such deterioration of CNS tissue results in permanent physical and mental disabilities in patients3,4. Currently, the majority of therapies for MS are anti-inflammatory in nature and are designed to address the inflammation observed in initial stages of the disease5. Unfortunately, these therapies only offer short-lived relief as more than half of MS patients will progress into disease phenotypes that are independent of inflammation and instead better characterized by degeneration of neuronal tissue6-8. Development of neuroprotective interventions could better address this issue of long-term treatment and offer better preventative measures against patient debilitation. One attractive therapeutic target is microRNAs (miRNAs). These are short, non-coding RNA sequences that are ubiquitously expressed in cells and regulate gene expression9. miRNAs act by inhibiting the translation of messenger RNAs (mRNAs) in the cytoplasm and thereby preventing gene expression10. A single miRNA can target multiple mRNAs and thus regulate large gene networks; not surprisingly, they are dysregulated in a number of human diseases including MS9,11. CNS lesions and immune cells of patients have been characterized to have abnormal miRNA expression profiles compared to healthy controls12. Previously, our lab has investigated the regulation of miRNAs in experimental autoimmune encephalomyelitis (EAE) mice, an animal model of MS. This model induces an autoimmune response against the CNS by introducing a myelin peptide into circulation. This sensitization process produces a disease phenotype that reflects certain aspects of MS13. In motor neurons of EAE mice at climax of their disease, we found that one particular miRNA, miR-223, was upregulated about 40 times relative to healthy controls. Current literature related to miR-223 characterizes its involvement in ischemic stroke, differentiation of specific immune cell subsets, and in some cancers. In MS, miRNA-profiling studies have observed miR-223 to be upregulated in patient brain lesions14. Additionally, a recent study in EAE mice found that miR-223 was overexpressed in immune cells and demonstrated that knocking out miR-223 in these animals could reduce disease progression15. The effects of miR-223 in neurons in the context of MS have not yet been explored. Here, the goal of our project was to investigate these effects and understand what role miR-223 plays in neurons in an inflammatory context, like MS. Because miR-223 was upregulated in degenerating neurons of EAE mice, we hypothesized that miR-223 promotes neurodegeneration and has aberrant roles in neurons. To carry out our investigations, we utilized a reductionist in vitro model that mimicked the inflammatory context of the CNS in MS patients (Fig. 1A). We transfected mouse cortical neurons cultures with miR-223 mimics in order to overexpress miR-223. These cultures were then treated with conditioned media (CM) from cultures of rat peripheral-blood mononuclear cells (PBMC). This media contained inflammatory factors secreted from immune cells and its introduction into neuronal cell cultures was meant to simulate the inflammatory environment of the CNS in MS. Previous work has found that PBMC-CM treatment in cortical neuron cultures inhibited outgrowth16 and caused degeneration of neurite processes17. By using this model, we could manipulate miR-223 expression and observe its effects on neurons in an inflammatory environment. If miR-223 has neurodegenerative effects, then its overexpression should exacerbate damages caused by PBMC-CM treatment. 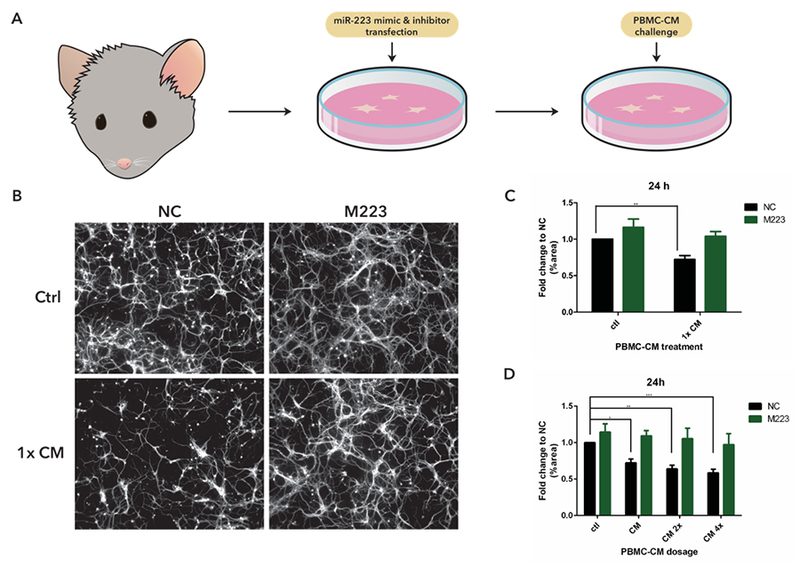 Contrary to our original hypothesis, our results indicated that miR-223 has a neuroprotective role in PBMC-CM treated neurons (Fig. 1B). At 24 h after PBMC-CM treatment, control transfected neurons displayed significant degeneration of neurite processes. However, neurons overexpressing miR-223 did not experience this degenerative effect, pointing to a potentially protective role of miR-223 (Fig. 1C). In a PBMC-CM treatment dose curve, we observed a steady increase in neurodegeneration of control transfected neurons with increasing doses of CM. Neurons overexpressing miR-223 instead displayed a sustained resistance against increasing doses of PBMC-CM treatment and did not show significant neurite degeneration (Fig. 1D). Even at the highest dosage, miR-223 overexpressed neurons showed a similar amount of neurite processes to control treated neurons, suggesting miR-223 has a robust protective role. Additionally, we found that PBMC-CM-induced damage was independent of cell death, and injury was limited to the retraction and transection of neurite processes. We also observed that miR-223 overexpression did not significantly improve overall cell viability, as measured by ATP levels. It is likely that the effects of miR-223 acts through the protection of neuronal processes, and not by improving overall cell health. Our findings here were unexpected and especially interesting against a backdrop of literature that characterizes miR-223 as proinflammatory and damaging in autoimmune disorders15,18. Contrary to previous findings, our current results suggest that overexpression of miR-223 in neurons may actually be beneficial in inflammatory environments. This dichotomous effect could be attributed to a difference in targets and function between cell types. Previous studies have focused their investigations on miR-223 in immune cells and its effects in neurons have not been explored. It is possible that, in contrast to immune cells, miR-223 overexpression in neurons acts as a protective response against inflammatory cues. This additional complexity has important implications in therapies. Treatments that aim to overexpress miR-223 must specifically target neurons and avoid effects in immune cells as it may otherwise advance illness progression. 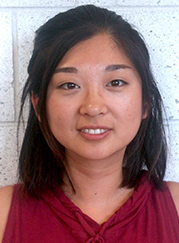 Future research on the downstream targets of miR-223 would offer clarity on its contrasting roles between immune cells and neurons. Ultimately, these investigations can contribute to a better understanding of cellular processes within neurons in MS and are great investments towards improving therapies for patients. Figure 1 miR-223 is neuroprotective against PBMC-CM induced damage. (A) Methodology flow chart of in vitro cell culture model. (B) Fluorescent images of bIII-tubulin stained neuron cultures. Top headers signify transfection condition, and side headers signify CM treatment. Negative control (NC) transfection neurons treated with PBMC-CM show neurite degeneration, while miR-223 mimic transfection (overexpression) did not. (C) Neurons overexpressing miR-223 did not show degeneration compared to controls, 24 h after condition media treatment. ** p<0.01. (D) 1x, 2x, and 4x dose CM treated control transfected neurons showed significant degeneration. Degeneration across all doses was averted with miR-223 mimic transfection. *p<0.05 **p<0.01 ***p<0.001. 1 Adelman, G., Rane, S. G. & Villa, K. F. The cost burden of multiple sclerosis in the United States: a systematic review of the literature. J Med Econ 16, 639-647, doi:10.3111/13696998.2013.778268 (2013). 2 Miller, E. in Neurodegenerative Diseases (ed Shamim I. Ahmad) Ch. 17, (Springer-Verlag 2012). 3 Mallucci, G., Peruzzotti-Jametti, L., Bernstock, J. D. & Pluchino, S. The role of immune cells, glia and neurons in white and gray matter pathology in multiple sclerosis. Prog Neurobiol 127-128, 1-22, doi:10.1016/j.pneurobio.2015.02.003 (2015). 4 Trapp, B. D., Ransohoff, R. M., Fisher, E. & Rudick, R. A. Neurodegeneration in Multiple Sclerosis: Relationship to Neurological Disability. The Neuroscientist 5, 48-57, doi:10.1177/107385849900500107 (1999). 5 Castro-Borrero, W. et al. Current and emerging therapies in multiple sclerosis: a systematic review. Therapeutic advances in neurological disorders 5, 205-220, doi:10.1177/1756285612450936 (2012). 6 Haines, J. D., Inglese, M. & Casaccia, P. Axonal damage in multiple sclerosis. The Mount Sinai journal of medicine, New York 78, 231-243, doi:10.1002/msj.20246 (2011). 7 Leray, E. et al. Evidence for a two-stage disability progression in multiple sclerosis. Brain 133, 1900-1913, doi:10.1093/brain/awq076 (2010). 8 Dutta, R. & Trapp, B. D. Pathogenesis of axonal and neuronal damage in multiple sclerosis. Neurology 68, S22-31; discussion S43-54, doi:10.1212/01.wnl.0000275229.13012.32 (2007). 9 Li, Y. & Kowdley, K. V. MicroRNAs in Common Human Diseases. Genomics, Proteomics & Bioinformatics 10, 246-253, doi:10.1016/j.gpb.2012.07.005 (2012). 10 Huntzinger, E. & Izaurralde, E. Gene silencing by microRNAs: contributions of translational repression and mRNA decay. Nature reviews. Genetics 12, 99-110, doi:10.1038/nrg2936 (2011). 11 Grimson, A. et al. MicroRNA targeting specificity in mammals: determinants beyond seed pairing. Molecular cell 27, 91-105, doi:10.1016/j.molcel.2007.06.017 (2007). 12 de Faria Jr., O. et al. MicroRNA dysregulation in multiple sclerosis. Frontiers in genetics 3, 311, doi:10.3389/fgene.2012.00311 (2012). 13 McCarthy, D. P., Richards, M. H. & Miller, S. D. Mouse models of multiple sclerosis: experimental autoimmune encephalomyelitis and Theiler's virus-induced demyelinating disease. Methods in molecular biology 900, 381-401, doi:10.1007/978-1-60761-720-4_19 (2012). 14 Junker, A. et al. MicroRNA profiling of multiple sclerosis lesions identifies modulators of the regulatory protein CD47. Brain 132, 3342-3352, doi:10.1093/brain/awp300 (2009). 15 Ifergan, I., Chen, S., Zhang, B. & Miller, S. D. Cutting Edge: MicroRNA-223 Regulates Myeloid Dendritic Cell-Driven Th17 Responses in Experimental Autoimmune Encephalomyelitis. J Immunol 196, 1455-1459, doi:10.4049/jimmunol.1501965 (2016). 16 Pool, M. et al. Neurite outgrowth is differentially impacted by distinct immune cell subsets. Molecular and cellular neurosciences 49, 68-76, doi:10.1016/j.mcn.2011.09.004 (2012). 18 Fulci, V. et al. miR-223 is overexpressed in T-lymphocytes of patients affected by rheumatoid arthritis. Hum Immunol 71, 206-211, doi:10.1016/j.humimm.2009.11.008 (2010).